Imagine an industry dominated by businesses that offer poor service, enjoy a terrible public image and lose billions of pounds. They don’t go bust, but increase their market share under a supportive regulatory system. A ludicrous scenario, of course – but it describes much of Britain’s banking industry today. 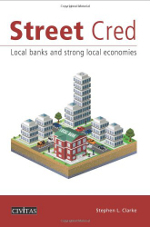 Street Cred examines the failings of the current British banking market and the lessons that can be learned from local banks across Europe. The report considers Britain’s banking system past and present, and explains how regulatory barriers to entry have bequeathed us a banking sector that is seriously unfit for service. This has harmed customers, businesses and neglected regions. Stephen L. Clarke explains how local banks helped to absorb much of the shock of the financial crisis in the Swiss and German economies, fostering a better recovery than that seen in the UK.